The squeeze theorem espresses in precise mathematical terms a simple idea. In this page we'll focus first on the intuitive understanding of the theorem and then we'll apply it to solve calculus problems involving limits of trigonometric functions. Pablo always gets a better grade than Peter's or the same. Pablo always gets a worse grade than Mary's or the same. This is on any given exam, Pablo always gets a better grade than Peter's (or the same). And also, the same grade is worse than Mary's (or the same). What is Pablo's grade? It is also B, right? You could say that Pablo's grade has been squeezed between Peter's and Mary's. This is the idea behind the squeeze theorem. Really simple! Now, let's translate this into the language of calculus. In the following video I tell the same things that are written in this section. You can watch and/or read below. That is, z(x) is always greater than or equal to u(x) and less than or equal to v(x). This is saying the same as the first two statements we had in our simple example earlier. That is, when x approaches a given number a, u(x) and v(x) have the same limit L.
The point where u(x), z(x) and v(x) touch (or almost) is the point (a, L). Because z(x) is squeezed between the other two functions at that point, it also has to approach that point. This theorem is actually useful to solve some limits. Let's see one of the most important applications of this theorem. This limit is very useful, because it can be used to solve other limits that involve trigonometric functions. In the following video I develop the proof, that is also written below. 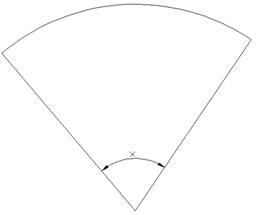 Let’s call x the angle in the triangle. We’ll also put names to the points and draw two extra lines, as shown in the figure below. One line goes from the center of the circle to the intersection with the other line. The other line a tangent to the circle. We will use this geometry to solve the limit. First, let's note the following. 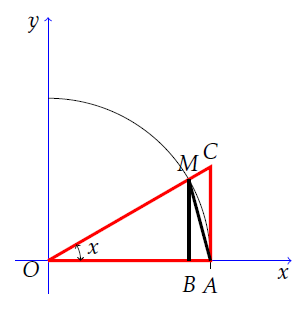 The area of triangle MOA is smaller than the area of circular sector MOA. Look at the picture and try to find those. Remember that the circular sector is like a slice of pizza. Look at the picture until you can see that the area of triangle MOA is smaller than the area of sector MOA. Now, let's note that the area of sector MOA is smaller than the area of triangle COA. Look at the picture and try to find that. Here we have an inequality. You start to see how we'll use the squeeze theorem? Now, what is OA? Look at our picture and try to find it. It is the radius of the circle. So, it is equal to 1. Now, we will use a property of inequalities. This property says "if A is less than B, the inverse of A is greater than B". The inverse of a number is 1 divided by that number. We just replaced the functions by the inverses, and changed the "less than" symbols with "greater than" symbols. 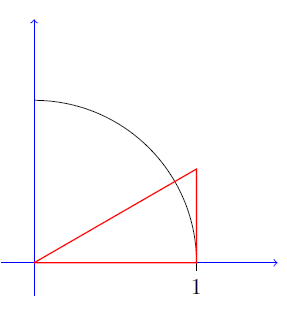 The figure above shos the three function to which we apply the squeeze theorem. 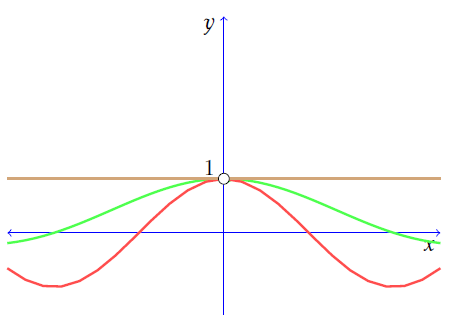 The green function is sinx/x, the red function is cosx and the brown function is the constant function 1. 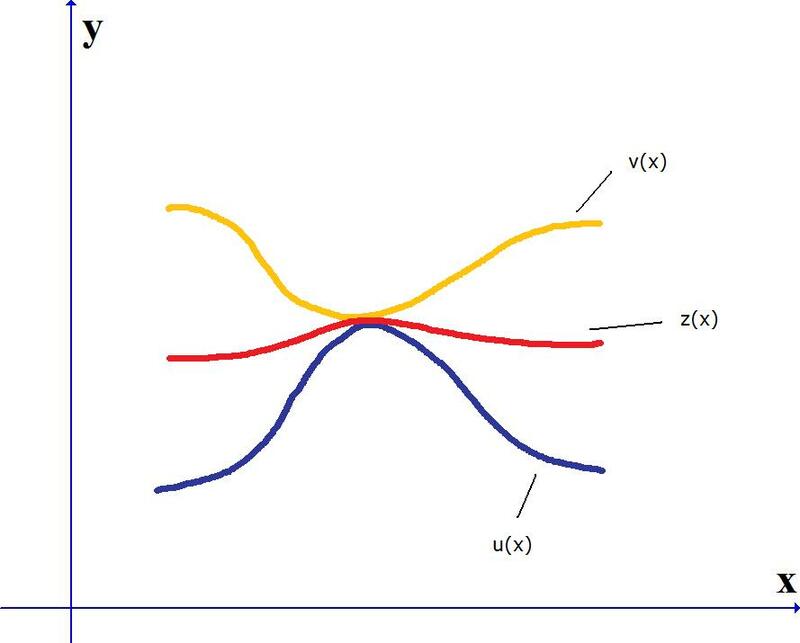 We can see how sinx/x is squeezed by the other two when x approaches 0. This may seem a lot of work to prove a simple limit. But you'll see that this is a really useful limit. We will use it now to solve other limits involving trigonometric functions. We will solve some problems involving limits with trigonometric functions. I just rearranged the original limit a little. I replaced tan(x) by sin(x) over cos(x) and moved the x a little, so it looks like the limit we just proved. If we just replace the x's by zero, we get 0/0! Let's look at our trigonometric formulas and try to find something that may be useful. Now, we have a sin of something in the numerator and an x in the denominator. You should start to think how to use our dear limit we proved. Keep in mind that what we proved in the previous section is the limit of sin(something) over something. The argument and the denominator don't necessarily need to be an "x". They can be any function, but they must be the same. We took one two of the numerator out of limit sign and separated the squared sin in two. Notice that this expression equals the same as the previous one. Here we just use the result we've got in the first limit and replace x by zero in the second one. This is a considerably "hard" limit. This is something you may expect to find in an exam. We just multiplied and divided by four. This is a useful technique in this type of limits. We just separate the expression and use the result we already know. The rule of thumb is: whenever you have a limit with trigonometric functions, and x approaching 0, you may try to use the limit of sin(x) over x to find the limit. To put what you have learned into practice, you may consider purchasing The Calculus Problems Manual. This is a series of eBooks that contain the essential calculus problems you need to know how to solve. You'll practice with the types of problems teachers and professors like to put on tests. The first volume includes exercises on limits involving trignometric functions. To learn more go to: The Calculus Problems Manual.